Welcome to the Sparrow forum! Use the search bar at the top right. Be sure to click the link at the bottom of the search results: "You may also try your search at Google". Check the tag cloud on the left for tags that fit your question. Also have a look at the Sparrow Wiki. It contains a detailed manual, tutorials and code snippets. Write your question in the appropriate forum section. Add appropriate tags so that others can find your question easily. Finally: you'd do us a real favor by looking around if there are unanswered questions YOU could help out with. Remember: each answered question gives us more time to work on Sparrow! FAQ: Why is my game slower than expected on the simulator? Most importantly: when testing performance, always test on a real device. The performance in the simulator has nothing to do with what is possible on a real iPhone or iPad. Furthermore, be sure to switch to RELEASE mode before analyzing the performance. There's an extensive tutorial about Performance Optimization on the Sparrow wiki -- be sure to check it out! FAQ: I have found a bug! What should I do? 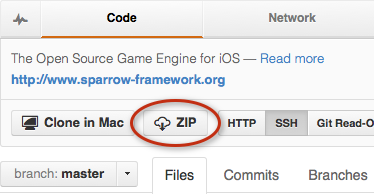 If you have found a bug, first do all you can to make sure it's really a problem of Sparrow, not an error in your code. Then head over the the GitHub issue tracker and see if the bug has already been reported. If it has not, first try to create a very simple demo application that has just one aim: to reproduce the error. Then open up a new issue, complete with a description of the error and the sample code, or a link to the zipped Xcode project. The advantage of the GitHub issue is that I'll see it quickly, while I can easily overlook bug reports in the forum, due to its heavy traffic. Thanks in advance! FAQ: Where can I download the latest HEAD REVISION of Sparrow? Sometimes, you need the absolute bleeding edge head revision of Sparrow, e.g. because it contains a bug fix or feature that's not in the latest stable version. Then, when you need a new version, just pull the latest changes from the repository. It's that easy!